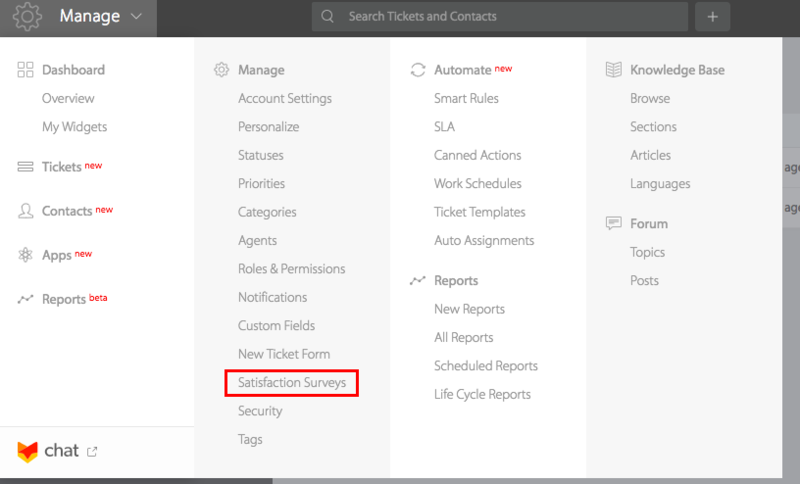 Click on the “+” button to open the create satisfaction survey. 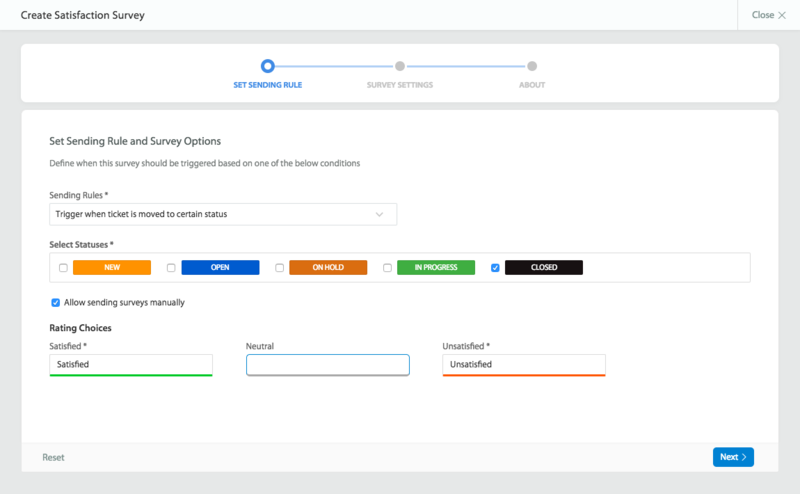 Set Sending Rule: This lets you configure the condition to when the survey should be triggered. Trigger for every agent reply: Sends survey on every agent reply made to a ticket. Trigger when ticket is moved to certain status: Sends survey when the ticket is moved to a certain status. Can be used when you want to trigger survey everytime a ticket is moved to a closure status. 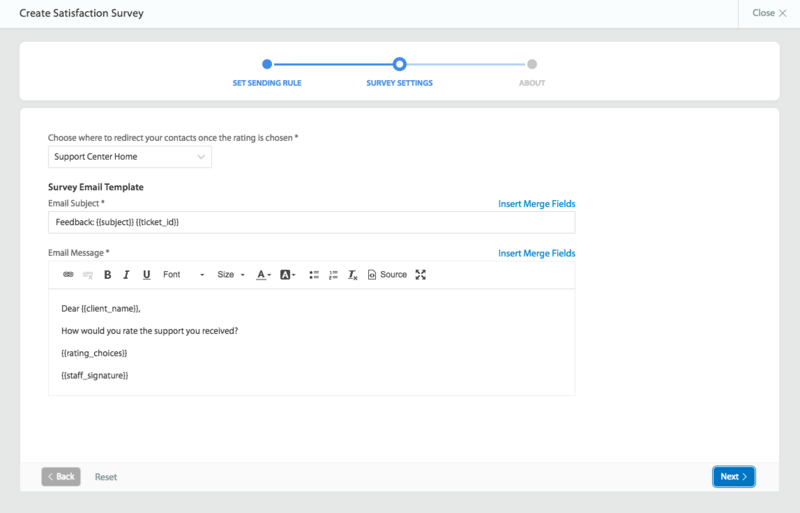 Trigger when ticket is moved to certain status along with Agent reply: Sends survey when the ticket is moved to a certain status and also has a agent reply added on the status change. This is additional check to the above option to avoid sending surveys for tickets where the status was moved to a certain status by smart rule. 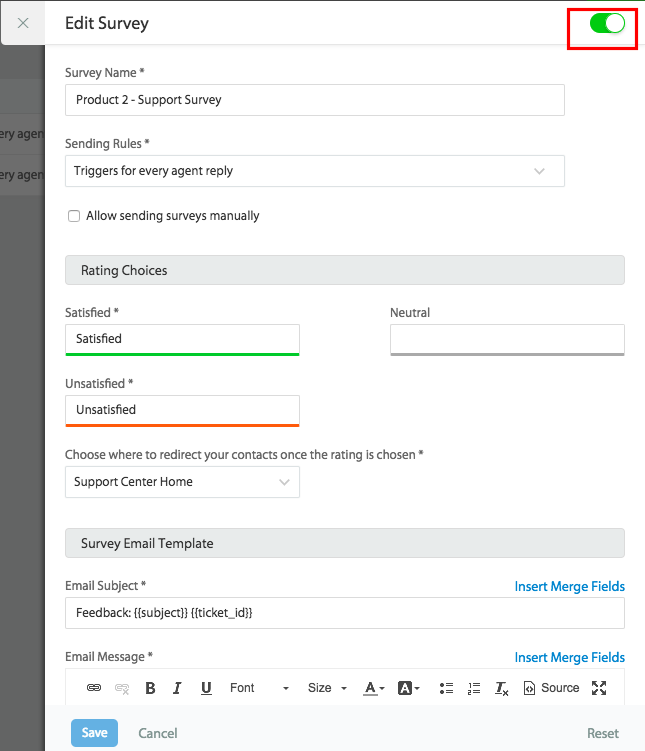 Allow sending survey manually: Allows agents to trigger this survey manually from any ticket through “Trigger Survey” option under more actions(irrespective of the condition defined above is met or not). Note: Agent’s visibility to“Trigger Survey” option in more actions is governed by the “Trigger surveys manually” permission. Rating choices: HappyFox provides three default options:Satisfied, neutral and unsatisfied.You to customise the display name for these ratings by overriding the values in each text box. Support Center Home: Redirects the contacts to your support home on survey submission. Custom URL: Redirects your contacts to the configured URL on survey submission. 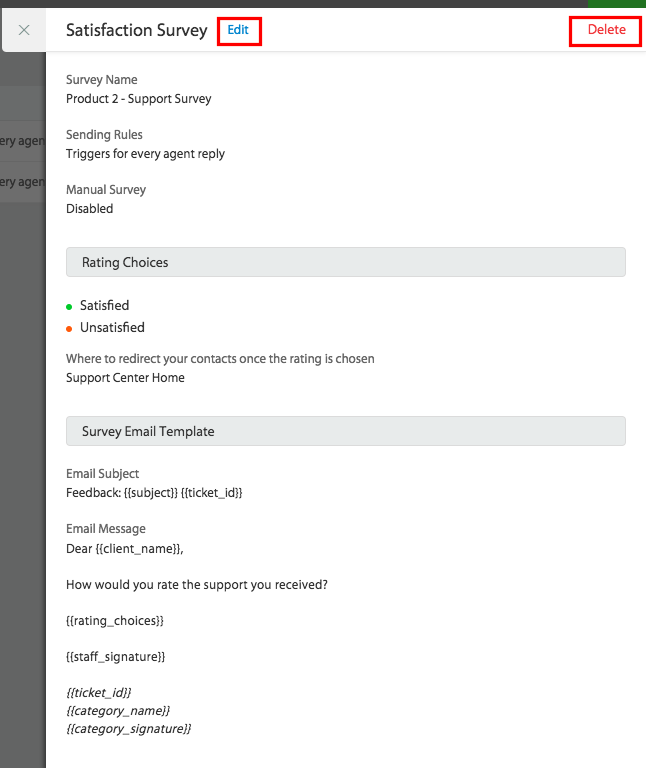 Survey Email Template: Allows you to customise the survey email content and subject. Associate Category: Allows you to associate a survey to desired categories. This helps in creating individual surveys for different categories such as billing/sales/IT. Status: Is enabled by default. When disabled, surveys are not triggered. Click on the surveys to open the read only form of the survey. Use the Edit/Delete options to perform the desired action. Click on the survey and click on “Edit” link. You can view the status toggle at the top. You can also view the status of each survey from the table view “Active” column. Green indicates active surveys and Grey indicates the inactive surveys.